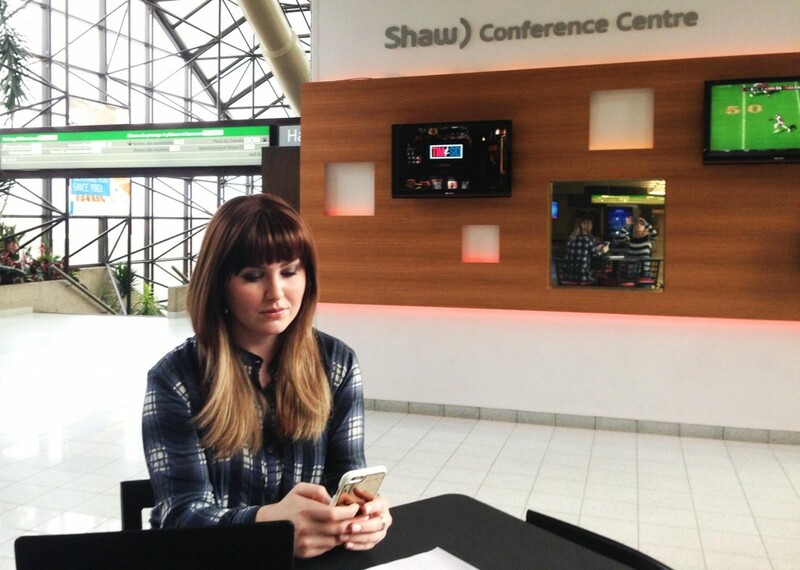 Have you ever wondered what exactly goes on behind the scenes at the Edmonton Convention Centre (SCC)? We have been publishing a series of articles on our blog that highlight some of the staff that work with and at the Edmonton Convention Centre (SCC). For our last post, we sat down with Alejandro Falcon, one of our Security Supervisors. This week, we reveal the face behind SCC’s social media channels in an interview with Alex Hryciw, Social Media Specialist. Alex makes sure to capture everything that is going on in our building to share with you on Twitter, Facebook, Instagram and more. 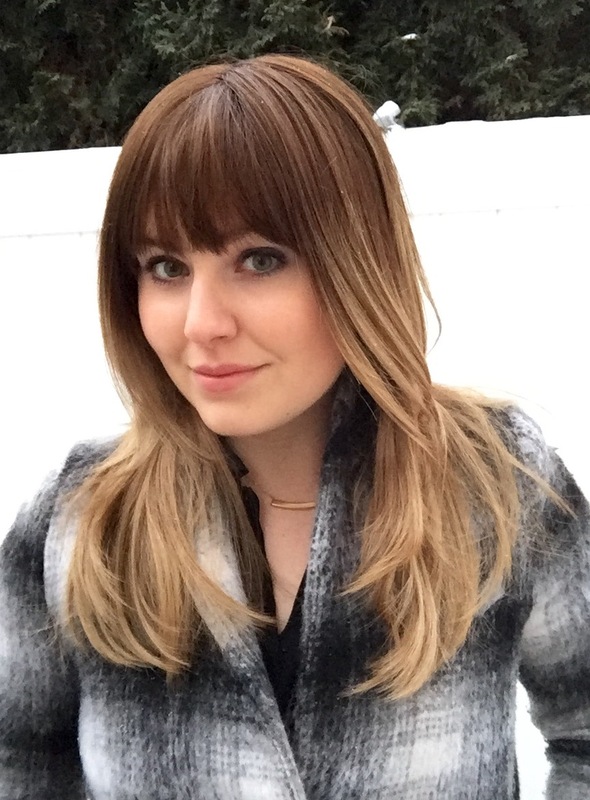 She was also the Digital Asset Project Manager for Edmonton’s Red Bull Crashed Ice event last March. Alex has now moved on to be the Strategic Social Media Advisor to Edmonton Mayor Don Iveson. We are thrilled for Alex and wish her the best in her new role. Alex working from the Pedway Level at the SCC. Social media is constant, so a typical day for me begins and ends on my phone. I fully admit to having an addiction to technology, but that’s the name of the social media game! In the morning I dive into creating and scheduling content, targeting posts and review what’s going live that day. Throughout the day, I listen to, engage with, and amplify content our guests and community are posting. The busiest times of day are early morning, noon and, evening, when people are most active online. In some cases, we have events that go until 6 a.m., which means I need to be available to answer any inquires and ensure we’re meeting our guests needs. It can be a demanding schedule but it’s a passion of mine. What management tools or mobile apps help you get your job done? We rely a lot on Sprout Social. Visually I have found it the most appealing of all the management tools I’ve used. I appreciate seeing content in calendar form. Sprout Social generates great reports and breaks down your social audience for you, allowing you to better target content and garner more engagement. Their mobile app is also extremely user friendly and great for busy days when I need to make fast changes and only have my phone. What are some of the most exciting things going on at the SCC that you want people to know about? What the Centre does around sustainability is always one of my favourite topics to cover. I enjoy emphasizing and showcasing what we do to protect the land and environment that the building was constructed on. The Community Medicine Wheel Garden we opened this year was an exciting build and such a great contribution to downtown Edmonton! How do you deal with negative feedback online? I see any feedback we receive as an opportunity to improve our guests experience. Conversations are taken offline so we can speak to guests verbally as in the online space, things can sometimes be misinterpreted. I believe it is important to talk to the person voice-to-voice to understand their issue, where we may have went wrong, and how we can not only mitigate the impact on their experience, but ensure it doesn’t happen again. There’s a certain amount of negativity you have to deal with, but that’s just a part of the job. What type of posts receive the most engagement? What do Edmontonians get extra excited about online? Edmontonians love Edmonton! I find that people get really engaged around posts that emphasize our contribution to the community. Whether it’s a performer visiting here for the first time or a trade show that will bring great economic impact to the city, our online audience loves to be involved in sharing the news. The best part of my job is being integrated into almost every area of the organization. Social media now has to be a central part of an organization’s business strategy, especially in the events and venue business. Social media is where the audience is and where the opportunities are! One of the most satisfying things is capturing all the amazing experiences guests have in our venue every day. Amplifying those memories to the larger community showcases our venue as a destination for Edmontonians and visitors around the world. What are some of the things about the SCC that you find yourself talking about often in posts? I love talking about our location. We have one of the best views of the River Valley, and we are well connected to the downtown core. The fact that the Centre is located in the heart of Edmonton plays a big part in why people choose to hold their events here. How was working with Red Bull on the Crashed Ice project? Exhilarating. It was one of those projects that was non-stop from the moment it started. Edmonton picked up on it from day one. That made my job easier — to share the hype and positivity around the event with engaged followers across the world. The city was really supportive, and it showed. I drank a lot of Red Bull (laughing). What local social media accounts do you like to follow? What is your favourite blog post on SCC’s website? My favourite post is a recent one about the new East Indian menu we have here. It was really interesting to interview the Chef who poured his heart and soul into the menu. I could feel the passion he has for cooking these dishes — he had a certain sparkle in his eye the entire time we talked. It made me proud to showcase them for the SCC. He has created over 60 dishes for our guests to enjoy, from all over India. There is something for every palate. What have been your three favourite events that the SCC has hosted? The Walrus Talks Aboriginal City hosted by The Walrus magazine featured a panel of speakers who were here to discuss Aboriginal life in Canadian cities. The topics were powerful and moving. Each speaker evoked a lot of passion and the audience was incredibly engaged. The talks did an amazing job of highlighting Aboriginal achievements in our city, while underlining the work that still needs to be done. Red Bull Crashed Ice. I was online all night in a small meeting room onsite. When I walked outside and saw the crowds (over 75,000 people) surrounding the centre it was so gratifying. I hope the event will come back! Festival of Trees fundraiser for The University of Alberta Hospital Foundation. The event always gets me in a festive mood; it takes over our entire centre. Christmas is everywhere and it is an event for all ages. What are your favourite Edmonton hashtags to use on the SCC Twitter and Instagram accounts? The most rewarding part of this job is being a part of a team that contributes to making the city of Edmonton exceptional. I’m proud to live here, work here and, make an impact.